More mercury is showing up in Colorado's waters. An article in today's Rocky Mountain News reports that unsafe mercury levels have been found in five more water bodies. 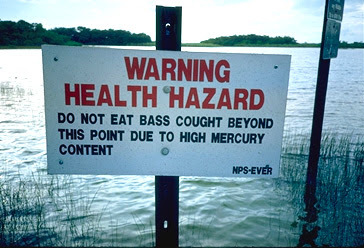 The number of Colorado water bodies with unsafe mercury contamination is now at 14 and rising. Mercury can lead to brain damage in developing fetuses, making this contamination trend downright frightening. At the same time, mercury pollution continues to be spewed unchecked from the smokestacks of coal burning power plants in Colorado. In fact, the majority of mercury contaminated waters are located in southwestern Colorado, where a cluster of coal burning power plants chug away. What's more, coal burning power plants are the largest source of mercury pollution in the United States. Like Mercury himself, the Roman God of Speed, this situation should send a swift message that mercury reductions from coal burning power plants are needed, and needed soon. Fortunately, the Colorado Air Quality Control Commission is mulling a decision to do just that. Unfortunately, of the proposals on the table, only one actually calls for straight-up mercury reductions from coal burning power plants across the state. The other proposals rely on a cap and trade system, a dangerous proposal that would actually allow increased mercury contamination. Mercury is not a commodity, it's a poison that needs to be taken out of our air, out of our water, and out of our lives. The Air Quality Control Commission is set to make a decision on mercury in February, hopefully they'll do the right thing for Colorado's children. Boulder Daily Camera: "We Were Wrong"